The New Zealand Bankers' Association (NZBA) has struck a surprisingly aggressive tone in its initial submission on the Reserve Bank's review of banks' capital adequacy requirements. The review was well sign-posted and has been a long time coming. In a post Global Financial Crisis world banks internationally, including the Aussie parents of New Zealand's big four, have been under continuous pressure to hold more capital. But based on NZBA's submission, NZ banks believe they are somehow different and don't require more capital. Of course it's no surprise that bank lobbyists are pushing back against the Reserve Bank. Holding more capital hits bank shareholders in the pocket. But arguing in 2017 that the bank capital status quo is hunky dory is trying to have their cake and eat it too. NZBA's sabre rattling includes the thinly veiled threat that the Reserve Bank should "consider the macroeconomic costs of higher capital." Or put another way, if our bottom line's hit we'll dump the costs on our customers. NZBA describes its initial submission, or salvo, as "high level", noting supporting detail will follow during the consultation phase. Legal heavyweight Chapman Tripp has been recruited to provide support for the banks. Interestingly, however, the law firm's submission is apparently addressing tax issues arising from the Reserve Bank's Issues Paper. Additionally NZBA says the banking industry has commissioned its own report, from PwC, on global capital ratio comparisons "to assist RBNZ in its review." Clearly bank bosses are not happy with the Reserve Bank's suggestion that NZ banks are "in the pack" in terms of their capital ratios relative to international peers. And doubtless the NZBA commissioned report will paint a different picture. NZBA goes as far as saying the current capital framework is adequately conservative and sufficiently strong, hence suggesting no change is required. Note - for example - under the current regime the country's biggest bank, ANZ Bank New Zealand, is required to hold capital of just $1.380 billion against $76.197 billion worth of home loans. The bank lobby group also mounts an attack on the suggestion that common equity tier one (CET1) capital is the highest quality capital available to banks, and is therefore preferable to other forms of capital. CETI primarily consists of ordinary shares and retained earnings. NZBA then embarks on a strident defence of convertible instruments such as capital notes, perpetual subordinated notes/bonds and other hybrid securities. It goes as far as claiming these securities are not legally complex nor opaque. From the banks' perspective there are clear benefits from the issuance of these convertible securities. The two key ones are getting suitable regulatory capital classification from the Reserve Bank for existing capital adequacy rules. And secondly, from an income tax perspective, obtaining deductibility for the coupons (interest) paid to investors on them. These debt securities are convertible in the sense that, should the bank issuer hit serious trouble, they could be converted into shares or even written-off. That means they may be able to help a bank absorb losses without triggering a default. Although the Reserve Bank has noted such securities are "essentially untested" in a NZ environment. And there could be a nasty shock for the investors who buy these securities with, potentially, their interest payment tap turned off or reduced to a trickle. Or investors could see their debt securities converted into shares if a bank issuer is in a tight corner. In Britain the Financial Conduct Authority restricted the retail distribution of such securities to investors who are sophisticated or high net worth. In Australia the Australian Securities and Investments Commission warned retail investors such hybrid securities offer a "big risk without a big return" and cautioned "you take all the risk." Here in New Zealand the Financial Markets Authority issued a guide in 2015 saying; "Capital notes are often issued by well-known banks, but are riskier than bank deposits. They may not be suitable for many investors. A household name and high headline rate of return alone are not good reasons to invest. You also need to understand the complex and potentially risky nature of these investments, and whether they are suitable for you." So whilst these convertible securities, known as CoCos in Europe, may work for banks from a short-term capital perspective, from a broader financial markets and even financial stability perspective, it can be argued they're not such a great idea. In a March speech Grant Spencer, Reserve Bank Deputy Governor and Head of Financial Stability, noted that by international standards, the Reserve Bank has taken a conservative approach to bank capital. This, he said, is warranted because of NZ’s relatively high risk profile, and the Reserve Bank’s "non-interventionist approach" to banking supervision. In terms of NZ's risk profile, this includes a reliance on commodity-based exports exposed to major price volatility, high bank exposure to housing, NZ being a net debtor country with current account deficits continuously over 40 years, a reliance on overseas funding, and a financial system dominated by just four entities. Meanwhile, the Reserve Bank's idiosyncratic light handed regulatory approach was highlighted by the International Monetary Fund in May. This approach means there are no on-site visits to banks where inspections could take place, and credit and operational risk could be checked. Thus, Spencer said, the capital adequacy review's likely to deliver an outcome where capital standards are seen as conservative relative to the international Basel standards and to the standards of peer countries. It's hard to argue with the commonsense of conservative capital standards in NZ given the Reserve Bank's hands-off regulatory approach. 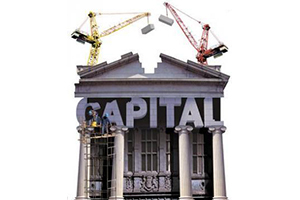 Spencer also rightly described bank capital as an important cushion for the financial system, standing first in line to absorb any losses that banks may incur. He also said; "Having sufficient capital promotes financial stability by reducing the likelihood of bank insolvency and moderating the effect of credit cycles." In terms of having conservative capital standards in comparison to peer countries, it's interesting to look at the CET1 ratios of NZ's big four banks versus those of their Aussie parents. At March 31 ANZ NZ was at 10.2% versus the ANZ Group at 10.1%. ASB was at 9.7% versus Commonwealth Bank of Australia's 9.6%. BNZ was at 10.55% versus National Australia Bank's 10.11%. And Westpac NZ was at 10.71% versus the Westpac Banking Corporation at 9.97%. Thus Westpac NZ is the only one of the four noticeably higher than its parent. Interestingly, this wide-ranging review of bank capital requirements comes at a time when the Reserve Bank leadership is both under some pressure, and poised to change. Governor Graeme Wheeler leaves in September. Spencer will then serve as Acting Governor for six months until March 2018 before a permanent replacement takes over. Against this backdrop, the Reserve Bank's attempt to get a debt-to-income tool added to its macro-prudential toolbox has been, at least for this year, kicked to the curb by Finance Minister Steven Joyce. There has also been justified negative publicity over Wheeler's flawed recent attempt to rein in BNZ's head of research Stephen Toplis. All this could leave an impression that, just perhaps, the banks are trying to take advantage of a perceived leadership vacuum at an under pressure regulator and push back hard against suggestions they ought to hold more capital. Against this backdrop, let's not forget that bank failures can happen. Even in NZ. Indeed the last major one in a NZ context was the BNZ in 1989-1990. Best, for the sake of the entire economy, to be as well prepared as possible in case such a scenario happens again. And this preparation ought to include higher capital requirements for our banks. Taking the requirement for the ANZ of $1.38 B for $76 B Loans. This equates to 1.8% so these figures of nearer 10% are not real but must be some risk weighted manipulation of the true situation. One only has to watch "The Big Short" (Netflix) to see how such manipulations of the true situation can unravel very quickly and disastrously. How much do house prices have to fall before the banks equity is wiped out? To be fair , if increasing Capital adequacy requirements and having a 'conservative Central Bank " makes our banks more secure than its got to be a good thing for depositors and ultimately our economy , whatever Ms Yellen thinks about no more GFC's "in our lifetime"
Its far better to err on the side of caution , and not allow the reckless days of the pre - GFC era to ever see the light of day again . There are still enough risks about to be concerned from the local housing market to China and who -knows -what- its -up -to , and the fact the world economy is still getting its fix from the easy money floating around from the QE policies of 2008 to March 2010 . We are not out of the woods , no matter how good we may be feeling down here with our economy flying . I guess this is the reason why the RBNZ reserves the legal right to invoke OBR to haircut depositor's savings in the event of a bank solvency crisis? Who else is left to pay? Not the local Aussie banks' parents, given their Australian regulator demands they claw back as much NZ based capital as the RBNZ permits to shore up domestic capital adequacy issues. These risks will remain as long as the RBNZ believes banks are intermediating saver's efforts to lend to their best creditworthy debtors, when in fact they are undertaking something much more objectionable, which savers shouldn't be liable for. What banks do is to simply reclassify their accounts payable items arising from the act of lending as ‘customer deposits’, and the general public, when receiving payment in the form of a transfer of bank deposits, believes that a form of money had been paid into the bank. No balance is drawn down to make a payment to the borrower. The bank does not actually make any money available to the borrower: No transfer of funds from anywhere to the customer or indeed the customer’s account takes place. There is no equal reduction in the balance of another account to defray the borrower. Instead, the bank simply re-classified its liabilities, changing the ‘accounts payable’ obligation arising from the bank loan contract to another liability category called ‘customer deposits’. While the borrower is given the impression that the bank had transferred money from its capital, reserves or other accounts to the borrower’s account (as indeed major theories of banking, the financial intermediation and fractional reserve theories, erroneously claim), in reality this is not the case. Neither the bank nor the customer deposited any money, nor were any funds from anywhere outside the bank utilised to make the deposit in the borrower’s account. Indeed, there was no depositing of any funds. The bank’s liability is simply re-named a ‘bank deposit’. What would be safer options for cash than having it in the bank? You could buy government bonds,like Kiwibonds. The interest rate offered is low,but as long as you think that our government is more secure than a bank,then you might sleep easier. Spending it or stashing it. There isn't enough cash to stash - Currently, RBNZ circulating currency liabilities are reported at $5.919bn. Banks' vault share is valued at $782 million. And yet bank funding ("depositors' assets") is claimed to be $404.435bn. Significantly, owners of ~$146.919bn O/N call depo prefer liquidity options ahead of term deposit returns.